I have often acknowledged how lucky I am too have water flowing out of a tap whenever I choose. I have camped and traveled enough to know that this luxury is not always available. However, I have never had to live and work in a city with water. Water lines are forming and are longer than any lines I have ever saw while working at a grocery store during high school when snow was predicted. I could not go out to eat last night, therefore I tried my hand at cooking. You can check out the pics, by clicking here or below on the album. 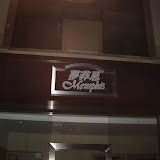 Also, in the album is a pic from Shanghai, that reads "Memphis". The other pics are from a park near my home that I like to visit. It contains the remnants of an old temple that stood there before the city began to modernize. It is cool to see the old with the new. This weekend I have changed some plans around so that I may visit a friend in a nearby town to take a shower and do laundry. I don't have enough water to last me much longer, therefore I will have to visit the long lines soon enough. Everyone and every news station is talking about the water problem in China, except for the Int'l news channels are not saying a word. I will be looking forward to clean water so that I may shower regularly in my home, run my toothbrush under the faucet, wash my dishes, clean my clothes, eat out at the restaurants in town, and perhaps take water for granted again. Check out these pics of the lake where the water comes from...yummy!